After a few years I came to realize how limiting such a paradigm was. If I can do the job of each direct report, then I have leaders just as limited as myself working for me. I have hung on to that question over the years, and found it to be an important evaluation of a leader’s viability. I’ve worked for bosses I wouldn’t hire and I’ve consulted leaders who wouldn’t stand a chance of being hired by their own staff. Power allows leaders to “tell others.” YOU set appointments with employees; employees request appointments with you. YOU make policy and others adjust. YOU set budgets and departments exist within those limits. Leaders who grow use to “telling others” rather than “being told” insulate themselves with power over time. Watch for loyalty more than productivity. Lead from position and not relationship. Feel threatened by dissenting opinions. Justify perks they deny to others. Lead with the threat of action and not the integrity of decisions. Leaders who remain in charge because they are insulated by power would never get hired by their own staff. One of the hardest things for seasoned leaders to do is accept that leadership approaches change. As newer leaders come to work for us we expect them to glean from our experience and adopt our time-tested leadership approaches. I often work with churches in which senior pastors expect successful youth events to be run just like successful adult events. And when the same success indicators are not used, I’ve seen a senior leader disqualify a very successful youth event. This happens when leaders suffer from generational disconnect. Ever since the invention of the VCR there has been a time-warp in generational development. Now the world of technology allows younger generations to grow up as natives of new technology while older adults struggle to immigrate into the digital age. Today’s older leaders have to become a student and not a critic of younger leaders. Leaders who don’t know how to show generational respect wouldn’t get hired by their staff. The nature of employment is changing. Today’s rapidly connecting and often volatile economy is forcing people to think differently about being an employee. I like what career strategist J.T. Odonnell calls today’s employee, “A Company of One.” It has become the responsibility of the individual to keep her skill set current and her options open. Gone are the days of the 40 year career with all the necessary OJT (On the Job Training) needed to remain employable. When I hear bosses who came of age in the growing ’80’s or dot-com ’90’s speak despairingly of today’s employees, I think, “That’s a boss who could benefit from a dose of unemployment, so they could experience the fight to get back into the workforce.” It’s a fight that involves a lot of rediscovery and reinventing of the working self. 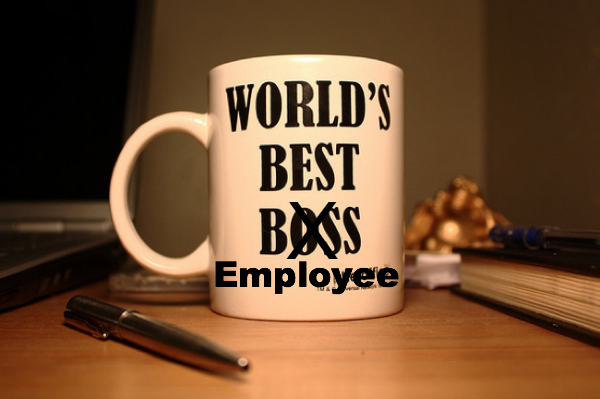 A boss that is hirable by her own staff will adapt to the changing world of employment and ensure that her employees are better off for having worked on her staff. As an employer I choose to believe that what is a benefit to my employees cannot be a curse to me. By keeping that mindset I have the best chance of being the kind of boss my own staff would love to hire.